I want to shear my own sheep, which machine do I need? If you always have mains power where your sheep are then a 240 volt machine will do. Always use a Circuit Breaker, and keep any extension cables up out of the way. If you want to use the machine away on the hill, or in the field, use a battery powered machine. There is a range of battery powered machines now available. These should be safer to use, and can be used in the field, from a vehicle's own battery, or a spare battery. Some now work off a rechargeable battery and are fully portable. For either, you need a machine powerful enough to cope with the numbers and breed, and the timescale you have to complete the job..
Finer Wool sheep such as Texels and Suffolks and lustre wool such as Wensleydale and Teeswater take more power than more open wool sheep like Swaledales. Similarly, if you want to do them all in one day, you may need a more powerful machine than if you shear a few over several days. Are you intending to shear a lot more sheep in the next few years, or stay as you are? An oilbath handpiece is less expensive to maintain long-term, but requires additional oiling through an oil hole screw once a day. Bearing handpieces are generally smoother running, but are more expensive to buy and can be more expensive to maintain. Can I telephone with questions? Yes, we are available from 8:00am to 5:00pm on Monday to Friday and from 8:00am to 12:00pm on Saturdays. Yes, we take orders over the telephone. Call to speak to one of the team. Orders taken on the website are charged in GB Pounds. If your bank account uses another currency, you will be charged in your own currency at the current exchange rate. A currency converter is provided on this website as a guide, but the exact amount which is charged in your currency may vary slightly. Is your website checkout secure? Yes, All payments are through the Bank's own secure system. We do not see, or receive any Card details on our computer. How many sheep can I shear before changing the comb and cutter? • Breed of sheep / openness of fleece. • Sand/grit in the fleece. • Correct setting up of handpiece. 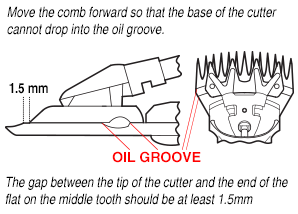 • Frequency of oiling comb and cutter. The range would be from less than 5, if shearing sandy sheep, up to 50 in good conditions on open wool sheep. This is the fitting where the handpiece connects on to the drive-shaft of the machine. Traditionally machines were pin drive, which connects to a visible slot on the bayonet end on the inner drive. These are still used on many new machines. 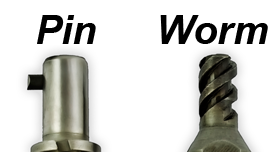 Worm (or spline) drive was developed in Australia as an extra safety measure, if the handpiece locks up the drive separates from the handpiece. For sheep shearing machines we would recommend SAE 30 oil. Can I trade my old machine/handpiece in? Yes, please call or e-mail for details. How do I send things to you? Small items are regularly sent to us by post. You should ensure you get Certificate of Posting from the Post Office as a minimum or consider sending valuable items by recorded delivery. Many of our customers are now turning to couriers to send parcels, particularly machines. You will find some of the best rates at www.wedelivertheworld.co.uk or www.worldwide-parcelservices.co.uk. These websites compare different courier rates and offer you the best prices. They will arrange a courier to collect items from you and the delivery to us - it's much quicker and easier than standing in the Post Office queue!